At today’s presentation, which was held as part of the Unpacked 2018 event, Samsung Electronics introduced its first smart Galaxy Home column. The novelty is to compete with HomePod, which was partly inspired by the engineers and designers of the Korean company. 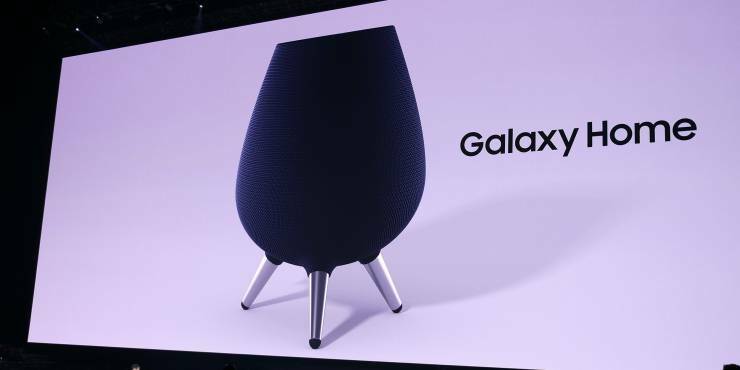 You can call me the hater of Samsung, but the appearance of Galaxy Home causes me to associate with a trash can, a spittoon, or, at worst, a vase in which the Papuans cook food for the whole tribe. This contributes to the specific shape of the boiler, completing the resemblance of three spread out legs. Inside the case, there are six loudspeakers located in a circle and one powerful subwoofer that was pointed down (probably the feet are designed to not impede the bass output). Thanks to this arrangement of speakers, the speaker will be able to provide surround sound without showing any special requirements to its location. Like HomePod, Galaxy Home is able not only to broadcast the sound in all directions but also to hear the user, from which side he was. The subtle hearing of Samsung’s smart speaker is facilitated by a system of precisely tuned microphones, allowing Bixby’s voice assistant to recognize commands regardless of the location of their source. Since Samsung does not have its own Apple Music, the Koreans had to negotiate with Spotify to provide owners of the brand speaker with music “out of the box.” Thanks to cross-platform streaming service, its subscribers can listen to music on the smartphone, switch the playback to Galaxy Home. According to representatives of Spotify, the column itself will offer to do this if it detects the user in the reach zone. It is characteristic that Samsung, like Apple in its time, was not ready for a full-fledged release of Galaxy Home. Therefore, the manufacturer refused to mention even the approximate time for the appearance of the column on sale, leaving its retail price in secret.